This is going to be the motto for my life. If I want to see my community become healthier and live healthier lifestyles, I need to practice what I preach. My personal change comes slowly. As I learn something new, I try to incorporate it into my life. I’m a work in progress. Every year I conduct a Hypertension Screening program at Memorial where the local hospital staff comes and do blood pressure screenings for members of my church. In general, hypertension is pretty darn high in the African American Community. My church members are not the exception. Personally, my numbers have always been borderline. I always start off ridiculously high. The physicians aren’t really surprised by this given how I run the program, my stress levels are pretty high. The physicians/nurses are careful to let us know that blood pressure levels can fluctuate day by day..even hour by hour. After they talk to me (sometimes flirt with me- young Drs are pretty funny) and I relax, my numbers usually fall within 120/80 range. The Alta Bates Health Ministry Program coordinator is pretty worried that the community numbers are pretty high. 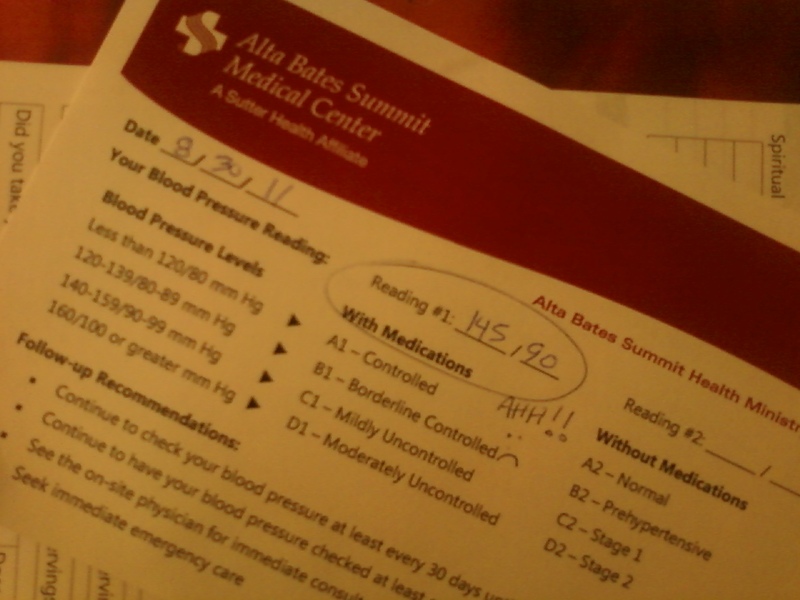 So she implemented a 12-week hypertension pilot program and recruited ministry leaders like myself to join. I thought cool..why not! I can learn something and bring it back to the church. What’s the first thing I learned during our first day in the program? My numbers are 145/90!! In February my numbers were 121/88. What a difference six months makes! That was the first reading. I didn’t have the nurse do another reading. I could have. I walked the mile and half to get the hospital, I got lost, and was a little late. Anxiety..stress, all of that could have been a factor in my score fluctuating. I could have had the nurse calm me down and found my numbers back in the normal range. However I don’t think my pressure should get that high just because I am stressed. Right? So for the next 12 weeks, I will be a part of a hypertension management program. Once a week I will go to the hospital and get my numbers. Then, I will get training on healthy eating, exercise, stress management, the works! As someone who works in public health (childhood obesity specifically) I know all of this stuff. However, knowing and putting it into practice all the time are two different things. Being in this program will get me back on track..and I will have fear friends (and strangers) to help keep me there. So 12 week program, here I come!! I will share my progress with you, dear reader, and hopefully you will learn something as well. 1. Eat 5 a day: 2 fruits, 3 vegetables. I can eat anything else I want, just make sure to have those 5 a day. Baby steps! 3. Figure out my spiritual routine (once I read this booklet that was provided I will share more about it). Do you know your numbers..Care to share? (If you don’t know your numbers go to your doctor/clinic/Walgreens or homie/lover/nurse/friend and find out). Got any great tips you would like to share? Questions you would like me to answer? Let me know! 2 Responses to 145/90 ..Ouch!! Adventures in Hypertension. that we need or exercise like we should (not you..but in general). This was a sure wake-up cal for me. I’m to grown now. I need to be responsible!